Bill O’Reilly apparently saw the recent shooting at the ultra-conservative Family Research Council as some kind of proof that he bore no responsibility for the death of abortion doctor George Tiller. O’Reilly’s thinking seemed to go something like this: a politically-motivated maniac tried to shoot up the FRC (but only succeeded in wounding a security guard) and the liberal media thought it no big deal. Therefore, that proved that when a politically-motivated maniac shot and killed Dr. Tiller, the harsh (liberal media) spotlight on O’Reilly’s inflammatory rhetoric was simply more liberal-bias baloney. Unfortunately for O’Reilly, FRC head Tony Perkins was more interested in blaming the Southern Poverty Law Center, a staunch critic of the FRC, for “creating an environment that led” to the shooting than he was in attacking the media. “You may remember back in 2009, some in the liberal press accused me of encouraging the assassination of late-term abortionist George Tiller,” O’Reilly said in a discussion with Perkins last night. He went on to play a video of another abortion doctor saying that O’Reilly had engaged in “hate speech” that was “designed to get Dr. Tiller killed and it worked.” (Note: I removed the clip from the video below to avoid copyright infringement. But you can watch it in its original context, in a report on Dr. Tiller’s killing on the PBS show, NOW. These instances and others we reviewed clearly show that O'Reilly was not reporting the views of others, but was expressing his own views on the doctor. To get a fuller flavor of just how inflammatory O’Reilly’s rhetoric really was, check out this video mashup put together by Daily Kos’ Jed Lewison. I hate to say it, Bill, but you’re wrong again. 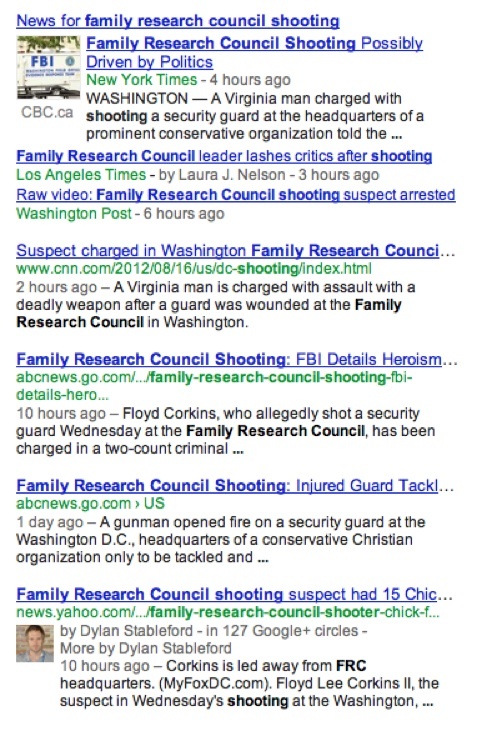 I just Googled “family research council shooting” and got six very recent articles from the likes of the “liberal” New York Times, Los Angeles Times, Washington Post, CNN, ABC News and Yahoo News. Perkins accused the Southern Poverty Law Center “of creating an environment that led to this” because they had labeled FRC a hate group. “That gives license to lunatics like, like this to come in with a gun and shoot innocent people,” he said. Priscilla has more on just why the Family Research Council has been designated as a hate group. O’Reilly said, “I didn’t exacerbate that situation,” meaning with Dr. Tiller, but added that he will “check that out absolutely” about the SPLC. He continued complaining about the “scant” media coverage of the FRC shooting. As O’Reilly ran down the shooter's liberal bona fides (he volunteered at a gay clinic, he had lots of sandwiches from Chick-Fil-A with him), it was clear where O’Reilly was trying to go: The liberal media only cares about liberals getting killed and they only “went after” him because of their anti-conservative agenda. Memo to Bill O’Reilly: Why don’t you just come clean about the demonizing you did, do some kind of atonement and stop trying to defend what was really indefensible? I think we’d all feel better if you did. According to the idiots at Newsbusters, CBS is ignoring the LBGT volunteer angle, as they have apparently been unable to find evidence they even mentioned it on their site articles. They also proved they can’t read, because they’re also making the same accusation against MSNBC, and they make mention of it in their articles. Hey, didn’t Koldys write for these people?
" âThat gives license to lunatics like, like this to come in with a gun and shoot innocent people,â he said." Actually, Billo, it’s no more dangerous than those claims that Pres. Obama is a Muslim terrorist that is trying to take guns away from goobers, or calling Tiller a Baby-Killer, or so many of the other idiocy that Fox spews on a daily basis. But you’re okay with that, right?? Bildo: The most influential thing in TV news, but don’t try to make him accountable for anything he spews out of his ugly piehole. I hate to say it, Bill, but youâre wrong again. I just Googled âfamily research council shootingâ and got six very recent articles from the likes of the âliberalâ New York Times, Los Angeles Times, Washington Post, CNN, ABC News and Yahoo News. Yeah, FOX “news” and its talking heads do this quite a bit – say the so-called liberal media has been silent on something when they actually haven’t been. So much of the time it seems to be nothing more than a biased, knee-jerk claim that they automatically throw out there as red meat for their sheeple to gnaw on (especially BOR and F&F). If FOX “news” didn’t have the so-called liberal media to attack/demean/kick around, half their programming would be dead air time. Memo to Bill OâReilly: Why donât you just come clean about the demonizing you did, do some kind of atonement and stop trying to defend what was really indefensible? I think weâd all feel better if you did. BOR is in total denial about the part he played in what happened to Tiller. But that’s the way BOR rolls – It’s kinda pitiful really because all it does is showcase the kind of deceit that BOR is okay with (at least outwardly). Maybe what he did is eating him up inside and, if it is, I can’t say that I feel sorry for him. He used his platform at FOX “news” to target an individual and now that person is dead. SPLC=Shysters Punking Liberal Chumps. Uber-con artist Morris Dees laughs all the way to the bank. Yes Killer, you have learned well from Saint Hitler’s Night of the Long Knives. Adolf stated that Other People had bad feeling about the SA, and Other People did the killing – just like you.